Not to be confused with intonation (linguistics). Tone is the use of pitch in language to distinguish lexical or grammatical meaning – that is, to distinguish or to inflect words. All verbal languages use pitch to express emotional and other paralinguistic information and to convey emphasis, contrast, and other such features in what is called intonation, but not all languages use tones to distinguish words or their inflections, analogously to consonants and vowels. Languages that do have this feature are called tonal languages; the distinctive tone patterns of such a language are sometimes called tonemes, by analogy with phoneme. Tonal languages are common in East and Southeast Asia, the Pacific, Africa, and the Americas; as many as seventy percent of world languages may be tonal. In many tonal African languages, such as most Bantu languages, tones are distinguished by their pitch level relative to each other, known as a register tone system. In multisyllable words, a single tone may be carried by the entire word rather than a different tone on each syllable. Often, grammatical information, such as past versus present, "I" versus "you", or positive versus negative, is conveyed solely by tone. In the most widely spoken tonal language, Mandarin Chinese, tones are distinguished by their distinctive shape, known as contour, with each tone having a different internal pattern of rising and falling pitch. Many words, especially monosyllabic ones, are differentiated solely by tone. In a multisyllabic word, each syllable often carries its own tone. Unlike in Bantu systems, tone plays little role in the grammar of modern standard Chinese, though the tones descend from features in Old Chinese that had morphological significance (such as changing a verb to a noun or vice versa). Contour systems are typical of languages of the Mainland Southeast Asia linguistic area, including Kra–Dai, Vietic and Sino-Tibetan languages. The Afroasiatic, Khoisan, Niger-Congo and Nilo-Saharan languages spoken in Africa are dominated by register systems. Some languages combine both systems, such as Cantonese, which produces three varieties of contour tone at three different pitch levels, and the Omotic (Afroasiatic) language Bench, which employs five level tones and one or two rising tones across levels. Many languages use tone in a more limited way. In Japanese, fewer than half of the words have a drop in pitch; words contrast according to which syllable this drop follows. Such minimal systems are sometimes called pitch accent since they are reminiscent of stress accent languages, which typically allow one principal stressed syllable per word. However, there is debate over the definition of pitch accent and whether a coherent definition is even possible. Most languages of Sub-Saharan Africa are members of the Niger-Congo family, which is predominantly tonal; notable exceptions are Swahili (in the southeast), most languages spoken in the Senegambia (among them Wolof, Serer and Cangin languages), and Fulani. The Afroasiatic languages include both tonal (Chadic, Omotic) and nontonal (Semitic, Berber, Egyptian, and most Cushitic) branches. All three Khoisan language families—Khoe, Kx'a and Tuu—are tonal. Numerous tonal languages are widely spoken in China and Mainland Southeast Asia. Sino-Tibetan languages (including Burmese, Tibetan (a language with cases), and most varieties of Chinese; though some, such as Shanghainese, are only marginally tonal) and Kra–Dai languages (including Thai and Lao) are mostly tonal. The Hmong–Mien languages are some of the most tonal languages in the world, with as many as twelve phonemically distinct tones. Austroasiatic (such as Khmer and Mon) and Austronesian (such as Malay Javanese, Tagalog, and Maori) languages are mostly non tonal with the rare exception of Austroasiatic languages like Vietnamese, and Austronesian languages like Cèmuhî and Tsat. Tones in Vietnamese and Tsat may result from Chinese influence on both languages. There were tones in Middle Korean. Other languages represented in the region, such as Mongolian, Uyghur, and Japanese belong to language families that do not contain any tonality as defined here. In South Asia, many Indo-Aryan languages have tonality, including many languages from the Northwest zone, like Punjabi, Dogri, and Lahnda and many Bengali-Assamese languages such as Sylheti, Rohingya, Chittagonian and Chakma. In Europe, Indo-European languages such as Swedish, Norwegian, Limburgish and Scots (Germanic languages), Serbo-Croatian and Slovene (Slavic languages), Lithuanian and Latvian (Baltic languages), have tonal characteristics. Although the Austronesian language family has some tonal members such as New Caledonia's Cèmuhî language, no tonal languages have been discovered in Australia. Tone is also present in many Papuan languages. A large number of North, South and Central American languages are tonal, including many of the Athabaskan languages of Alaska and the American Southwest (including Navajo), and the Oto-Manguean languages of Mexico. Among the Mayan languages, which are mostly non-tonal, Yucatec (with the largest number of speakers), Uspantek, and one dialect of Tzotzil have developed tone systems. However, although tone systems have been recorded for many American languages, little theoretical work has been completed for the characterization of their tone systems. In different cases, Oto-Manguean tone languages in Mexico have been found to possess tone systems similar to both Asian and African tone languages. Over 50% of the Sino-Tibetan languages. All Sinitic languages (most prominently, the Chinese languages), some Tibetic languages, including the standard languages of Tibet and Bhutan, and Burmese. In the Austroasiatic family, Vietnamese and other members of the Vietic languages family are strongly tonal. Other branches of this family, such as Mon, Khmer, and the Munda languages, are entirely non-tonal. Some of the Malayo-Polynesian branch of Austronesian languages in New Caledonia (such as Paicî and Cèmuhî) and New Guinea (such as Mor, Ma'ya and Matbat) plus some of the Chamic languages such as Tsat in Hainan are tonal. The entire Kra–Dai family, spoken mainly in China, Vietnam, Thailand, and Laos, and including Thai and Lao is tonal. The entire Hmong–Mien family is highly tonal. Many Afroasiatic languages in the Chadic and Omotic branches have register tone systems, including Hausa. Omotic languages are an exception in having both contour and register tones. Some Cushitic languages also have tone systems. The vast majority of Niger–Congo languages, such as Ewe, Igbo, Lingala, Maninka, Yoruba, and the Zulu, have register tone systems. The Kru languages have contour tones. Notable non-tonal Niger–Congo languages are Swahili, Fula, and Wolof. Most Nilo-Saharan languages including Dinka and Luo have register tone systems. All Khoisan languages in southern Africa have contour tone systems; some languages like Sandawe have mixed tone systems like that of Cantonese. Slightly more than half of the Athabaskan languages, such as Navajo, have register tone systems (languages in California, Oregon and a few in Alaska excluded). The Athabaskan tone languages fall into two "mirror image" groups. That is, a word which has a high tone in one language will have a cognate with a low tone in another, and vice versa. Iroquoian languages like Mohawk commonly have register tone; Oklahoma Cherokee has the most extensive tonal inventory, with six tones, of which four are contours. Here the correlation between contour tone and simple syllable structures is clearly shown; whereas Mohawk, with three register tones in stressed syllables only, permits a large number of consonant clusters, Cherokee phonotactics permit only syllables of the structure (s)(C)V.
All Oto-Manguean languages are tonal. Most have register tone, though some have contour tones as well. In some cases, as with Mixtec, tone system variations between dialects are sufficiently great to cause mutual unintelligibility. Many languages of New Guinea like Siane possess register tone systems. Some Indo-European languages as well as others possess what is termed pitch accent, where only the stressed syllable of a word can have different contour tones; these are not always considered to be cases of tone language. Some European-based creole languages, such as Saramaccan and Papiamento, have tone from their African substratum languages. In some cases it is difficult to determine whether a language is tonal. For example, the Ket language has been described as having up to eight tones by some investigators, as having four tones by others, but by some as having no tone at all. In cases such as these, the classification of a language as tonal may depend on the researcher's interpretation of what tone is. For instance, the Burmese language has phonetic tone, but each of its three tones is accompanied by a distinctive phonation (creaky, murmured or plain vowels). It could be argued either that the tone is incidental to the phonation, in which case Burmese would not be phonemically tonal, or that the phonation is incidental to the tone, in which case it would be considered tonal. Something similar appears to be the case with Ket. The 19th-century constructed language Solresol can consist of only tone, although, unlike all natural tonal languages, Solresol's tone is absolute rather than relative and no tone sandhi occurs. Most languages use pitch as intonation to convey prosody and pragmatics, but this does not make them tonal languages. In tonal languages, each syllable has an inherent pitch contour, and thus minimal pairs (or larger minimal sets) exist between syllables with the same segmental features (consonants and vowels) but different tones. The tone contours of Standard Chinese. In the convention for Chinese, 1 is low and 5 is high. The corresponding tone letters are ˥ ˧˥ ˨˩˦ ˥˩. A neutral tone, with no specific contour, used on weak syllables; its pitch depends chiefly on the tone of the preceding syllable. Pinyin: Māma mà mǎde má ma? Vietnamese has its version: Bấy nay bây bày bảy bẫy bậy. Translation: A person why stay endured due to a day have introduced a knife and a print. Tone is most frequently manifested on vowels, but in most tonal languages where voiced syllabic consonants occur they will bear tone as well. This is especially common with syllabic nasals, for example in many Bantu and Kru languages, but also occurs in Serbo-Croatian. It is also possible for lexically contrastive pitch (or tone) to span entire words or morphemes instead of manifesting on the syllable nucleus (vowels), which is the case in Punjabi. Tones can interact in complex ways through a process known as tone sandhi. With convoluted intonation, it appears that high and falling tone conflate, while the low tone with convoluted intonation has the same contour as rising tone with falling intonation. "High tone" redirects here. For other uses, see High tone (telephony). Tone systems fall into two broad patterns, according to whether contour tones exist. Most varieties of Chinese use contour tone systems, where the distinguishing feature of the tones are their shifts in pitch (that is, the pitch is a contour), such as rising, falling, dipping, or level. Most Bantu languages, on the other hand, have non-contour tone (or register tone) systems where the distinguishing feature is the relative difference between the pitches, such as high, mid, or low, rather than their shapes. In such systems there is a default tone, usually low in a two-tone system or mid in a three-tone system, that is more common and less salient than other tones. There are also languages that combine relative-pitch and contour tones, such as many Kru languages, where nouns are distinguished by contour tones and verbs by pitch. Others, such as Yoruba, have phonetic contours, but these can easily be analysed as sequences of single-pitch tones, with for example sequences of high–low /áà/ becoming falling [âː], and sequences of low–high /àá/ becoming rising [ǎː]. Falling tones tend to fall further than rising tones rise; high–low tones are common, whereas low–high tones are quite rare. A language with contour tones will also generally have as many or more falling tones than rising tones. However, exceptions are not unheard of; Mpi, for example, has three level and three rising tones, but no falling tones. In a number of East Asian languages, tonal differences are closely intertwined with phonation differences. In Vietnamese, for example, the ngã and sắc tones are both high-rising but the former is distinguished by having glottalization in the middle. Similarly, the nặng and huyền tones are both low-falling, but the nặng tone is shorter and pronounced with creaky voice at the end, while the huyền tone is longer and often has breathy voice. In some languages, such as Burmese, pitch and phonation are so closely intertwined that the two are combined in a single phonological system, where neither can be considered without the other. The distinctions of such systems are termed registers, not to be confused with "register tones" described above. Tones are realized as pitch only in a relative sense. "High tone" and "low tone" are only meaningful relative to the speaker's vocal range and in comparing one syllable to the next, rather than as a contrast of absolute pitch such as one finds in music. As a result, when one combines tone with sentence prosody, the absolute pitch of a high tone at the end of a prosodic unit may be lower than that of a low tone at the beginning of the unit, because of the universal tendency (in both tonal and non-tonal languages) for pitch to decrease with time in a process called downdrift. Tones may affect each other just as consonants and vowels do. In many register-tone languages, low tones may cause a downstep in following high or mid tones; the effect is such that even while the low tones remain at the lower end of the speaker's vocal range (which is itself descending due to downdrift), the high tones drop incrementally like steps in a stairway or terraced rice fields, until finally the tones merge and the system has to be reset. This effect is called tone terracing. Sometimes a tone may remain as the sole realization of a grammatical particle after the original consonant and vowel disappear, so it can only be heard by its effect on other tones. It may cause downstep, or it may combine with other tones to form contours. These are called floating tones. 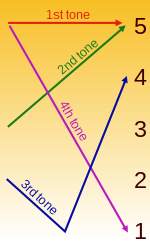 In many contour-tone languages, one tone may affect the shape of an adjacent tone. The affected tone may become something new, a tone that only occurs in such situations, or it may be changed into a different existing tone. This is called tone sandhi. In Mandarin Chinese, for example, a dipping tone between two other tones is reduced to a simple low tone, which otherwise does not occur in Mandarin Chinese, whereas if two dipping tones occur in a row, the first becomes a rising tone, indistinguishable from other rising tones in the language. For example, the words 很 [xɤn˨˩˦] ('very') and 好 [xaʊ˨˩˦] ('good') produce the phrase 很好 [xɤn˧˥ xaʊ˨˩˦] ('very good'). Another difference between tonal languages is whether the tones apply independently to each syllable or to the word as a whole. In Cantonese, Thai, and to some extent the Kru languages, each syllable may have a tone, whereas in Shanghainese, the Scandinavian languages, and many Bantu languages, the contour of each tone operates at the word level. That is, a trisyllabic word in a three-tone syllable-tone language has many more tonal possibilities (3 × 3 × 3 = 27) than a monosyllabic word (3), but there is no such difference in a word-tone language. For example, Shanghainese has two contrastive (phonemic) tones no matter how many syllables are in a word. Many languages described as having pitch accent are word-tone languages. After high level and high rising tones, the neutral syllable has an independent pitch that looks like a mid-register tone – the default tone in most register-tone languages. However, after a falling tone it takes on a low pitch; the contour tone remains on the first syllable, but the pitch of the second syllable matches where the contour leaves off. And after a low-dipping tone, the contour spreads to the second syllable: the contour remains the same (˨˩˦) whether the word has one syllable or two. In other words, the tone is now the property of the word, not the syllable. Shanghainese has taken this pattern to its extreme, as the pitches of all syllables are determined by the tone before them, so that only the tone of the initial syllable of a word is distinctive. Languages with simple tone systems or pitch accent may have one or two syllables specified for tone, with the rest of the word taking a default tone. Such languages differ in which tone is marked and which is the default. In Navajo, for example, syllables have a low tone by default, whereas marked syllables have high tone. In the related language Sekani, however, the default is high tone, and marked syllables have low tone. There are parallels with stress: English stressed syllables have a higher pitch than unstressed syllables, whereas in Russian, stressed syllables have a lower pitch. In East Asia, tone is typically lexical. This is characteristic of heavily tonal languages such as Chinese, Vietnamese, Thai, and Hmong. That is, tone is used to distinguish words which would otherwise be homonyms, rather than in the grammar, but some Yue Chinese dialects have minimal grammatical use of tone. However, in many African languages, especially in the Niger–Congo family, tone is crucial to the grammar, with relatively little lexical use. In the Kru languages, a combination of these patterns is found: nouns tend to have complex tone systems but are not much affected by grammatical inflections, whereas verbs tend to have simple tone systems of the type more typical of Africa, which are inflected to indicate tense and mood, person, and polarity, so that tone may be the only distinguishing feature between "you went" and "I won't go". In colloquial Yoruba, especially when spoken quickly, vowels may assimilate to each other, and consonants elide so much that much of the lexical and grammatical information is carried by tone. In languages of West Africa such as Yoruba, people may even communicate with so-called "talking drums", which are modulated to imitate the tones of the language, or by whistling the tones of speech. Note that tonal languages are not distributed evenly across the same range as non-tonal languages. Instead, the majority of tone languages belong to the Niger-Congo, Sino-Tibetan and Vietic groups, which are then composed by a large majority of tone languages and dominate a single region. Only in limited locations (South Africa, New Guinea, Mexico, Brazil and a few others) are tone languages occurring as individual members or small clusters within a non-tone dominated area. In some locations, like Central America, it may represent no more than an incidental effect of which languages were included when one examines the distribution; for groups like Khoi-San in Southern Africa and Papuan languages, whole families of languages possess tonality but simply have relatively few members, and for some North American tone languages, multiple independent origins are suspected. If generally considering only complex-tone vs. no-tone, it might be concluded that tone is almost always an ancient feature within a language family that is highly conserved among members. However, when considered in addition to "simple" tone systems that include only two tones, tone, as a whole, appears to be more labile, appearing several times within Indo-European languages, several times in American languages, and several times in Papuan families. That may indicate that rather than a trait unique to some language families, tone is a latent feature of most language families that may more easily arise and disappear as languages change over time. A 2015 study by Caleb Everett argued that tonal languages are more common in hot and humid climates, which make them easier to pronounce, even when considering familial relationships. This is perhaps the first known case of influence of the environment on the structure of the languages spoken in it. Certain varieties of Chinese are known to express meaning by means of tone change, although further investigations are required. Note that the tone change must be distinguished from tone sandhi. Tone sandhi is a compulsory change that occurs when certain tones are juxtaposed. Tone change, however, is a morphologically conditioned alternation and is used as an inflectional or a derivational strategy. Examples from two Yue dialects spoken in Guangdong Province are shown below. In Taishan, tone change indicates the grammatical number of personal pronouns. In Zhongshan, perfective verbs are marked with tone change. The following table compares the personal pronouns of Sixian dialect (a dialect of Taiwanese Hakka) with Zaiwa and Jingpho (both Tibeto-Burman languages spoken in Yunnan and Burma). From this table, we find the distinction between nominative, genitive, and accusative is marked by tone change and sound alternation. Note: The superscripted numbers indicate the Chao tone numerals. There are three main approaches to notating tones in phonetic descriptions of a language. The easiest from a typological perspective is a numbering system, with the pitch levels assigned numerals and each tone transcribed as a numeral or sequence of numerals. Such systems tend to be idiosyncratic (high tone may be assigned the numeral 1, 3, or 5, for example) and have not been adopted for the International Phonetic Alphabet. Also simple for simple tone systems is a series of diacritics such as ⟨ó⟩ for high tone and ⟨ò⟩ for low tone. This has been adopted by the IPA, but is not easy to adapt to complex contour tone systems (see under Chinese below for one workaround). The five IPA diacritics for level tones are ⟨ő ó ō ò ȍ⟩, with doubled high and low diacritics for extra high and extra low. The diacritics combined to form contour tones, of which ⟨ô ǒ o᷄ o᷅ o᷆ o᷇ o᷈ o᷉⟩ have Unicode font support (support for additional combinations is sparse). Sometimes, a non-IPA vertical diacritic is seen for a second higher mid tone, ⟨o̍⟩ so in a language with four or six level tones, they may be transcribed ⟨ó o̍ ō ò⟩ or ⟨ő ó o̍ ō ò ȍ⟩. A retired IPA system, sometimes still encountered, traces the shape of the tone (the pitch trace) before the syllable, where a stress mark would go (e.g., ⟨ˆo ˇo ˉo ˊo ˋo ˗o ˴o ˍo ˎo ˏo ˬo⟩). For a more concrete example, take the Hanyu Pinyin syllable [sa] used in Standard Chinese, after applying the diacritics it becomes easier to identify more specific rising and falling tones: [ˆsa] (high peaking tone), [ˍsa] (low level tone), etc. It was used in combination with stress marks to indicate intonation as well, as in English [ˈgʊd ˌɑːftə`nuːn]. The most flexible system, based on the previous spacing diacritics, is that of tone letters, which are iconic schematics of the pitch trace of the tone in question. They are most commonly used for complex contour systems, as in the languages of Liberia and southern China. ˧˩, ˧˨, ˨˩ ◌˥˧, ◌˥˦, ◌˦˧, &c. ◌˧˩, ◌˧˨, ◌˨˩, &c.
˧˥, ˧˦, ˦˥ ◌˧˥, ◌˦˥, ◌˧˦, &c. ◌˩˧, ◌˨˧, ◌˩˨, &c.
Very rarely, a tone letter consists of more than three elements (peaking or dipping tones), but occasionally, double-peaking or double-dipping tones are encountered. Reversed tone letters may be used for tone sandhi, and dot-plus-bar tone letters for neutral tones. Several variations are found. In many three-tone languages, it is common to mark high and Low tone as indicated above but to omit marking of the mid tone: má (high), ma (mid), mà (low). Similarly, in some two-tone languages, only one tone is marked explicitly, usually the less common one. With more complex tonal systems, such as in the Kru and Omotic languages, it is usual to indicate tone with numbers, with 1 for high and 4 or 5 for low in Kru, but 1 for low and 5 for high in Omotic. Contour tones are then indicated 14, 21, etc. In the Chinese tradition, numerals are assigned to various tones (see tone number). For instance, Standard Mandarin Chinese, the official language of China, has four lexically contrastive tones, and the numerals 1, 2, 3, and 4 are assigned to four tones. Syllables can sometimes be toneless and are described as having a neutral tone, typically indicated by omitting tone markings. Chinese varieties are traditionally described in terms of four tonal categories ping ('level'), shang ('rising'), qu ('exiting'), ru ('entering'), based on the traditional analysis of Middle Chinese (see Four tones); note that these are not at all the same as the four tones of modern standard Mandarin Chinese. Depending on the dialect, each of these categories may then be divided into two tones, typically called yin and yang. Typically, syllables carrying the ru tones are closed by voiceless stops in Chinese varieties that have such coda(s) so in such dialects, ru is not a tonal category in the sense used by Western linguistics but rather a category of syllable structures. Chinese phonologists perceived these checked syllables as having concomitant short tones, justifying them as a tonal category. In Middle Chinese, when the tonal categories were established, the shang and qu tones also had characteristic final obstruents with concomitant tonic differences whereas syllables bearing the ping tone ended in a simple sonorant. An alternative to using the Chinese category names is assigning to each category a numeral ranging from 1 to 8, sometimes higher for some Southern Chinese dialects with additional tone splits. Syllables belonging to the same tone category differ drastically in actual phonetic tone across the varieties of Chinese even among dialects of the same group. For example, the yin ping tone is a high level tone in Beijing Mandarin Chinese but a low level tone in Tianjin Mandarin Chinese. A mid-level tone would be indicated by /33/, a low level tone /11/, etc. The doubling of the number is commonly used with level tones to distinguish them from tone numbers; tone 3 in Mandarin Chinese, for example, is not mid /3/. However, it is not necessary with tone letters, so /33/ = simple /˧/. IPA diacritic notation is also sometimes seen for Chinese. One reason it is not more widespread is that only two contour tones, rising /ɔ̌/ and falling /ɔ̂/, are widely supported by IPA fonts while several Chinese varieties have more than one rising or falling tone. One common workaround is to retain standard IPA /ɔ̌/ and /ɔ̂/ for high-rising (/35/) and high-falling (/53/) tones and to use the subscript diacritics /ɔ̗/ and /ɔ̖/ for low-rising (/13/) and low-falling (/31/) tones. Hangul included tone marks for Middle Korean tones. However, Gyeongsang Dialect Korean, which is used in Southeastern regions of South Korea, are known to have a strong influence coming from tones. Standard Central Thai has five tones–mid, low, falling, high and rising–often indicated respectively by the numbers zero, one, two, three and four. The Thai written script is an alphasyllabary, which specifies the tone unambiguously. Tone is indicated by an interaction of the initial consonant of a syllable, the vowel length, the final consonant (if present), and sometimes a tone mark. A particular tone mark may denote different tones depending on the initial consonant. The Latin-based Hmong and Iu Mien alphabets use full letters for tones. In Hmong, one of the eight tones (the ˧ tone) is left unwritten while the other seven are indicated by the letters b, m, d, j, v, s, g at the end of the syllable. Since Hmong has no phonemic syllable-final consonants, there is no ambiguity. That system enables Hmong speakers to type their language with an ordinary Latin-letter keyboard without having to resort to diacritics. In the Iu Mien, the letters v, c, h, x, z indicate tones but unlike Hmong, it also has final consonants written before the tone. Several North American languages have tone, one of which is Cherokee, an Iroquoian language. Oklahoma Cherokee has six tones (1 low, 2 medium, 3 high, 4 very high, 5 rising and 6 falling). In Mesoamericanist linguistics, /1/ stands for high tone and /5/ stands for low tone, except in Oto-Manguean languages for which /1/ may be low tone and /3/ high tone. It is also common to see acute accents for high tone and grave accents for low tone and combinations of these for contour tones. Several popular orthographies use ⟨j⟩ or ⟨h⟩ after a vowel to indicate low tone. Southern Athabascan languages that include the Navajo and Apache languages are tonal, and are analyzed as having two tones: high and low. One variety of Hopi has developed tone, as has the Cheyenne language. The Mesoamerican language stock called Oto-Manguean is famously tonal and is the largest language family in Mesoamerica, containing languages including Zapotec, Mixtec, and Otomí, some of which have as many as five register tones (Trique, Usila Chinantec) and others only two (Matlatzinca and Chichimeca Jonaz). Other languages in Mesoamerica that have tones are Huichol, Yukatek Maya, the Tzotzil of San Bartolo, Uspanteko, and one variety of Huave. Many languages of South America are tonal. For example, various analyses of the Pirahã language describe either two or three tones. The Ticuna language isolate is exceptional for having five register tones (the only other languages in the Americas to have such a system are Trique and Usila, mentioned above). Swedish, Norwegian and Scots have simple word tone systems, often called pitch accent (although they are actually contour tones), appearing only in words of two or more syllables. Each word has a lexical tone, which varies by dialect. Words whose pronunciation differs only in tone are frequently morphologically or etymologically unrelated and may be spelled differently, as in Norwegian cider ('cider'), sider ('sides'). The two word tones are conventionally called tonelag [no]; tonem 1 and tonem 2 in Norway and acute accent and grave accent in Sweden. In Norway, there are two major dialectal divisions based on tone, roughly eastern and western/northern, where the tones have different values: in the east, T1 = level low, T2 = falling; in the west/north, T1 = falling, T2 = rising-falling. In Limburgish and Central Franconian dialects, tones can also occur in monosyllabic words: dáág ('day'), dáàg ('days'). Limburgish is typically a two-tone system, distinguishing between level high and falling, but the tones can be realized in other ways depending on syntax, and some vowels diphthongize or monophthongize under certain tones. Depending on the dialect, Latvian has a two-, three- or four-tone system. In Roman script orthographies, a number of approaches are used. Diacritics are common, as in pinyin, but they tend to be omitted. Thai uses a combination of redundant consonants and diacritics. Tone letters may also be used, for example in Hmong RPA and several minority languages in China. Tone may simply be ignored, as is possible even for highly tonal languages: for example, the Chinese navy has successfully used toneless pinyin in government telegraph communications for decades. Likewise, Chinese reporters abroad may file their stories in toneless pinyin. Dungan, a variety of Mandarin Chinese spoken in Central Asia, has, since 1927, been written in orthographies that do not indicate tone. Ndjuka, in which tone is less important, ignores tone except for a negative marker. However, the reverse is also true: in the Congo, there have been complaints from readers that newspapers written in orthographies without tone marking are insufficiently legible. Languages may distinguish up to five levels of pitch, though the Chori language of Nigeria is described as distinguishing six surface tone registers. Since tone contours may involve up to two shifts in pitch, there are theoretically 5 × 5 × 5 = 125 distinct tones for a language with five registers. However, the most that are actually used in a language is a tenth of that number. Several Kam–Sui languages of southern China have nine contrastive tones, including contour tones. For example, the Kam language has 9 tones: 3 more-or-less fixed tones (high, mid and low); 4 unidirectional tones (high and low rising, high and low falling); and 2 bidirectional tones (dipping and peaking). This assumes that checked syllables are not counted as having additional tones, as they traditionally are in China. For example, in the traditional reckoning, the Kam language has 15 tones, but 6 occur only in syllables closed with /p/, /t/ or /k/, and the other 9 occur only in syllables not ending in one of these sounds. Preliminary work on the Wobe language of Liberia and Côte d'Ivoire and the Chatino languages of southern Mexico suggests that some dialects may distinguish as many as fourteen tones, but many linguists believe that many of these will turn out to be sequences of tones or prosodic effects. André-Georges Haudricourt established that Vietnamese tone originated in earlier consonantal contrasts and suggested similar mechanisms for Chinese. It is now widely held that Old Chinese did not have phonemically contrastive tone. The historical origin of tone is called tonogenesis, a term coined by James Matisoff. Tone is sometimes an areal rather than a phylogenetic feature. That is to say, a language may acquire tones through bilingualism if influential neighbouring languages are tonal or if speakers of a tonal language shift to the language in question and bring their tones with them. The process is referred to as contact-induced tonogenesis by linguists. In other cases, tone may arise spontaneously and surprisingly fast: the dialect of Cherokee in Oklahoma has tone, but the dialect in North Carolina does not although they were separated only in 1838. Very often, tone arises as an effect of the loss or merger of consonants. The process of Transphonologization is sometimes nicknamed cheshirisation after the lingering smile of the disappearing Cheshire Cat in Alice in Wonderland. In a nontonal language, voiced consonants commonly cause following vowels to be pronounced at a lower pitch than other consonants. That is usually a minor phonetic detail of voicing. However, if consonant voicing is subsequently lost, that incidental pitch difference may be left over to carry the distinction that the voicing previously carried and thus becomes meaningful (phonemic). This process happened in the Punjabi language: the Punjabi murmured (voiced aspirate) consonants have disappeared and left tone in their wake. If the murmured consonant was at the beginning of a word, it left behind a low tone; at the end, it left behind a high tone. If there was no such consonant, the pitch was unaffected; however, the unaffected words are limited in pitch and did not interfere with the low and high tones. That produced a tone of its own, mid tone. The historical connection is so regular that Punjabi is still written as if it had murmured consonants, and tone is not marked. The written consonants tell the reader which tone to use. Similarly, final fricatives or other consonants may phonetically affect the pitch of preceding vowels, and if they then weaken to [h] and finally disappear completely, the difference in pitch, now a true difference in tone, carries on in their stead. This was the case with Chinese. Two of the three tones of Middle Chinese, the "rising" and the "departing" tones, arose as the Old Chinese final consonants /ʔ/ and /s/ → /h/ disappeared, while syllables that ended with neither of these consonants were interpreted as carrying the third tone, "even". Most varieties descending from Middle Chinese were further affected by a tone split in which each tone divided in two depending on whether the initial consonant was voiced. Vowels following a voiced consonant (depressor consonant) acquired a lower tone as the voicing lost its distinctiveness. The same changes affected many other languages in the same area, and at around the same time (AD 1000–1500). The tone split, for example, also occurred in Thai, Vietnamese, and the Lhasa dialect of Tibetan. In general, voiced initial consonants lead to low tones while vowels after aspirated consonants acquire a high tone. When final consonants are lost, a glottal stop tends to leave a preceding vowel with a high or rising tone (although glottalized vowels tend to be low tone so if the glottal stop causes vowel glottalization, that will tend to leave behind a low vowel). A final fricative tends to leave a preceding vowel with a low or falling tone. Vowel phonation also frequently develops into tone, as can be seen in the case of Burmese. 1. The table below is the process of tonogenesis in White Hmong, described by Martha Ratliff. The tone value described in the table are from Christina Esposito. 2. The table below shows the Vietnamese tonogenesis. The tone value is taken from James Kirby. 3. The table below shows the Chinese language tonogenesis. The tones across all varieties (or dialects) of Chinese correspond to each other, although they may not correspond to each other perfectly. Moreover, listed above are citation tones, but in actual conversations, obligatory sandhi rules will reshape them. The Sixian and Hailu Hakka in Taiwan are famous for their near-regular and opposite pattern (of pitch height). Both will be compared with Standard Chinese below. Tone arose in the Athabascan languages at least twice, in a patchwork of two systems. In some languages, such as Navajo, syllables with glottalized consonants (including glottal stops) in the syllable coda developed low tones, whereas in others, such as Slavey, they developed high tones, so that the two tonal systems are almost mirror images of each other. Syllables without glottalized codas developed the opposite tone. For example, high tone in Navajo and low tone in Slavey are due to contrast with the tone triggered by the glottalization. Other Athabascan languages, namely those in western Alaska (such as Koyukon) and the Pacific coast (such as Hupa), did not develop tone. Thus, the Proto-Athabascan word *tuː ('water') is toneless toː in Hupa, high-tone tó in Navajo, and low-tone tù in Slavey; while Proto-Athabascan *-ɢʊtʼ ('knee') is toneless -ɢotʼ in Hupa, low-tone -ɡòd in Navajo, and high-tone -ɡóʔ in Slavey. Kingston (2005) provides a phonetic explanation for the opposite development of tone based on the two different ways of producing glottalized consonants with either tense voice on the preceding vowel, which tends to produce a high F0, or creaky voice, which tends to produce a low F0. Languages with "stiff" glottalized consonants and tense voice developed high tone on the preceding vowel and those with "slack" glottalized consonants with creaky voice developed low tone. The Bantu languages also have "mirror" tone systems in which the languages in the northwest corner of the Bantu area have the opposite tones of other Bantu languages. Three Algonquian languages developed tone independently of one another and of neighboring languages: Cheyenne, Arapaho, and Kickapoo. In Cheyenne, tone arose via vowel contraction; the long vowels of Proto-Algonquian contracted into high-pitched vowels in Cheyenne while the short vowels became low-pitched. In Kickapoo, a vowel with a following [h] acquired a low tone, and this tone later extended to all vowels followed by a fricative. In Mohawk, a glottal stop can disappear in a combination of morphemes, leaving behind a long falling tone. Note that it has the reverse effect of the postulated rising tone in Mandarin Chinese, derived from a lost final glottal stop. ^ a b Yip (2002), pp. 1–3, 17-18. ^ R.L. Trask, A Dictionary of Phonetics and Phonology, Routledge 2004. Entry for "toneme". ^ Odden, David (1995). "Tone: African languages". Handbook of Phonological Theory. Oxford: Basil Blackwell. ^ Yip (2002), pp. 178–184. ^ a b c Maddieson, Ian (2013). "Tone". In Dryer, Matthew S.; Haspelmath, Martin (eds.). The World Atlas of Language Structures Online. Leipzig: Max Planck Institute for Evolutionary Anthropology. ^ Yip (2002), pp. 174–178. ^ Wedeking, Karl (1985). "Why Bench' (Ethiopia) has five level tones today". Studia Linguistica Diachronica et Sinchronica. Berlin: Mouton de Gruyter. pp. 881–902. ^ Yip (2002), p. 131. ^ Chen, Zhongmin. Studies in Dialects in the Shanghai Area. Lincom Europa, 2003, p. 74. ^ Yip (2002), pp. 172–173. ^ Ho-Min Sohn (29 March 2001). The Korean Language. Cambridge University Press. pp. 48–. ISBN 978-0-521-36943-5. ^ Iksop Lee; S. Robert Ramsey (2000). The Korean Language. SUNY Press. pp. 315–. ISBN 978-0-7914-4832-8. ^ Ki-Moon Lee; S. Robert Ramsey (3 March 2011). A History of the Korean Language. Cambridge University Press. pp. 168–. ISBN 978-1-139-49448-9. ^ Lust, Barbara; Wali, Kashi; Gair, James; et al., eds. (1999). Lexical Anaphors and Pronouns in Selected South Asian Languages. Walter de Gruyter. p. 637. ISBN 978-3-11-014388-1. ^ Ager, Simon (ed.). "Punjabi (ਪੰਜਾਬੀ/پنجابی)". Omniglot. Retrieved January 30, 2015. ^ Karamat, Nayyara. "Phonemic Inventory of Punjabi" (PDF). Center for Research in Urdu Language Processing. Retrieved January 30, 2015. ^ Sen, Geeti (1997). Crossing Boundaries. Orient Blackswan. p. 132. ISBN 978-81-250-1341-9. Possibly, Punjabi is the only major South Asian language that has this kind of tonal character. There does seem to have been some speculation among scholars about the possible origin of Punjabi's tone-language character but without any final and convincing answer. ^ a b Kingston (2005). ^ Yip (2002), pp. 212–214. ^ a b Montgomery-Anderson, Brad (May 30, 2008). A Reference Grammar of Oklahoma Cherokee (Ph.D.). University of Kansas. p. 49. ^ Tones change over time, but may retain their original spelling. The Thai spelling of the final word in the tongue-twister, ⟨ไหม⟩, indicates a rising tone, but the word is now commonly pronounced with a high tone. Therefore a new spelling, มั้ย, is occasionally seen in informal writing. ^ Singh, Chander Shekhar (2004). Punjabi Prosody: The Old Tradition and The New Paradigm. Sri Lanka: Polgasowita: Sikuru Prakasakayo. pp. 70–82. ^ Hombert, Jean-Marie; Ohala, John J.; Ewan, William G. (1979). "Phonetic Explanations for the Development of Tones". Language. 55 (1): 37–58. doi:10.2307/412518. JSTOR 412518. ^ Everett, C.; Blasi, D. E.; Roberts, S. G. (2015). "Climate, vocal folds, and tonal languages: Connecting the physiological and geographic dots". Proceedings of the National Academy of Sciences. 112 (5): 1322–1327. Bibcode:2015PNAS..112.1322E. doi:10.1073/pnas.1417413112. PMC 4321236. PMID 25605876. ^ Lewin, Sarah (April 1, 2015). "Wet Is Better for Tonal Languages". Scientific American. 312 (4): 19. doi:10.1038/scientificamerican0415-19. ^ Specifically, words that had the Middle Chinese ping (level) tone are now distributed over tones 1 and 2 in Mandarin Chinese, while the Middle Chinese shang (rising) and qu (exiting) tones have become Mandarin Chinese tones 3 and 4, respectively. Words with the former ru (entering) tone, meanwhile, have been distributed over all four tones. ^ The seminal references are Haudricourt (1954) and Haudricourt (1961). ^ Haudricourt, André-Georges (1954). "How to reconstruct Old Chinese (translation of: Comment reconstruire le chinois archaïque)". Word. 10 (2/3): 351–364. doi:10.1080/00437956.1954.11659532. Retrieved 12 January 2018. ^ Kirby, James & Marc Brunelle. (2017). Southeast Asian Tone in Areal Perspective. In R. Hickey (Ed. ), The Cambridge Handbook of Areal Linguistics (pp. 703-731). Cambridge: Cambridge University Press. ^ Ratliff, Martha. (2015). Tonoexodus, tonogenesis, and tone change. In P. Honeybone & J. Salmons (Eds. ), The Oxford Handbook of Historical Phonology (pp. 245-261). Oxford University Press. ^ Ratliff, Martha. (2017). Structure of Hmong-Mien Languages Session 3: Tonology. Slides for the 2017 LSA Institute at University of Kentucky. ^ Esposito, Christina M. (2012). An acoustic and electroglottographic study of White Hmong tone and phonation. Journal of Phonetics, 40(3), 466–476. ^ Garellek, Marc, Keating, Patricia, Esposito, Christina M., & Kreiman, Jody. (2013). Voice quality and tone identification in White Hmong. The Journal of the Acoustical Society of America, 133(2), 1078-1089. ^ Matisoff, James A. (1999). Tibeto-Burman tonology in an areal context. In Proceedings of the symposium Crosslinguistic studies of tonal phenomena: Tonogenesis, Japanese Accentology, and Other Topics (pp. 3-31). Tokyo: Tokyo University of Foreign Studies, Institute for the Study of Languages and Cultures of Asia and Africa. ^ Kirby, J. (2010). Dialect experience in Vietnamese tone perception. The Journal of the Acoustical Society of America, 127(6), 3749-3757. ^ Ratliff, Martha. (2002). Timing tonogenesis: Evidence from borrowing. Annual Meeting of the Berkeley Linguistics Society, 28(2), 29-41. ^ Dai, Yi-Chun. (1991). The phonological domain of tone in Chinese: Historical perspectives (Master's thesis). Simon Fraser University. ^ a b c Huang, Bo-Rong & Liao, Xu-Dong. [黄伯荣,廖序东] (2002). Xiandai Hanyu [现代汉语] (3rd ed., vol. 1), pp. 85-86. Beijing: 高等教育出版社. ^ a b Peking University Department of Chinese Language and Literature [北京大学中国语言文学系]. (1995). Hanyu Fangyan Cihui [汉语方言词汇] (2nd ed.). Beijing: 语文出版社. Bao, Zhiming (1999). The Structure of Tone. New York: Oxford University Press. ISBN 978-0-19-511880-3. Chen, Matthew Y. (2000). Tone sandhi: Patterns across Chinese dialects. Cambridge, England: Cambridge University Press. ISBN 978-0-521-65272-8. Clements, George N.; Goldsmith, John, eds. (1984). Autosegmental Studies in Bantu Tone. Berlin: Mouton de Gruyer. Fromkin, Victoria A., ed. (1978). Tone: A Linguistic Survey. New York: Academic Press. Halle, Morris; Stevens, Kenneth (1971). "A note on laryngeal features". Quarterly Progress Report 101. MIT. Hombert, Jean-Marie; Ohala, John J.; Ewan, William G. (1979). "Phonetic explanations for the development of tones". Language. 55 (1): 37–58. doi:10.2307/412518. JSTOR 412518. Hyman, Larry M., (2007a). "There is no pitch-accent prototype". Paper presented at the 2007 LSA Meeting. Anaheim, CA. Hyman, Larry M. (2009). "How (not) to do phonological typology: The case of pitch accent" (PDF). Language Sciences. 31 (2–3): 213–238. doi:10.1016/j.langsci.2008.12.007. Kingston, John (2005). "The phonetics of Athabaskan tonogenesis". In Hargus, Sharon; Rice, Keren (eds.). Athabaskan Prosody. Amsterdam: John Benjamins Publishing. pp. 137–184. Maddieson, Ian (1978). "Universals of tone". In Greenberg, J. H. (ed.). Universals of human language: Phonology. 2. Stanford: Stanford University Press. Odden, David (1995). "Tone: African languages". In Goldsmith, J. (ed.). Handbook of Phonological Theory. Oxford: Basil Blackwell. Wee, Lian-Hee (2008). "Phonological Patterns in the Englishes of Singapore and Hong Kong". World Englishes. 27 (3/4): 480–501. doi:10.1111/j.1467-971X.2008.00580.x. Yip, Moira (2002). Tone. Cambridge Textbooks in Linguistics. Cambridge: Cambridge University Press. ISBN 978-0-521-77314-0. ISBN 0-521-77445-4 (pbk). Wikimedia Commons has media related to Tones.